An evil neurotic space gorilla is searching the galaxy for magical children’s toys, which will allow him to take over the universe. It’s up to you – you being a 6ft tall dog in a suit and fedora, and a 3ft tall psychotic rabbit wearing nothing but a predatory grin (whose human ex – girlfriend is now a ghost) – to stop him. 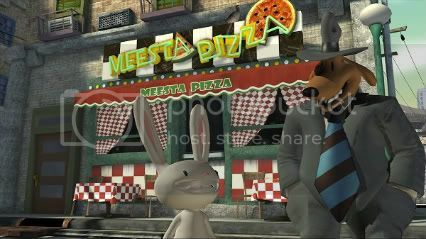 Welcome to the world of Sam & Max. 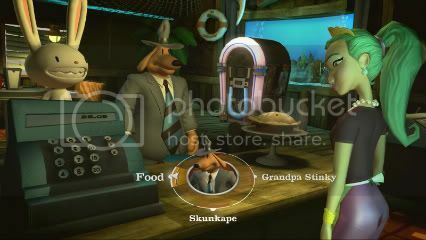 The original Sam & Max game was a hilarious and addictive point and click adventure, and if you didn’t already know that, shame on you. Telltale Games resurrected the dysfunctional duo in much the same way as they have with Monkey Island, and this is actually the third season of the new Sam & Max games. This first episode is titled The Penal Zone and yes, it is the subject of a joke or two. "What have I got in my pockets, little buddy?" "Your hands, Sam?" Telltale’s adventures tend to noticeably vary in quality between episodes, thanks to their bizarre decision to keep swapping writers around. How does The Devil’s Playhouse start off? Well the script starts firing one liners at you almost as soon as you start the game up; but unfortunately, some of those jokes fall a little flat. Overall the episode has some really great lines in there but, the problem is, they’re surrounded by dozens of significantly less impressive efforts. It’s never less than entertaining, but you can’t help but wish that it hit you with a belly laugh a little more often. The art design is a blessed million miles from the reeking mountain of grey shooters that looms over the industry, with the closest comparison being Psychonauts (or, er, the previous two Sam & Max seasons). On a technical level it’s only marginally more impressive than season one on the Wii but we don’t care, and nor should you. The graphics suit the Saturday morning cartoon style voices (though in terms of adult content, the script sits somewhere between The Simpsons and Family Guy) perfectly, and the acting here ranges from competent (the space gorilla) to perfect (Max). One character sounds exactly like Scrooge McDuck, and we hope it’s the same guy doing the voice. Duck tales, woo oo ooh! Etc. You can switch between control of Sam the dog or Max the rabbit at any time. This, and the aformentioned magic toys, are used for some very clever puzzles. Plotwise, Max is able to take advantage of the powers the toys contain, and the main two you’ll be using are ‘future vision’ and teleportation. Future vision allows you to see a very brief glimpse of the future relevant to the person or object you point it at, and teleportation allows you to teleport to the location of any mobile phone you have the number for. Generally speaking teleportation is used to quickly move between areas; but in a few instances it’s used for some truly inspired puzzles, which we stand up and roar applause in the general direction of Telltale Games for. If you haven't played the game and only 'Food' makes sense to you, don't worry, that just means you're not as crazy as everyone thinks you are. Speaking of the puzzles, you shouldn’t find that they give you much trouble. If you do struggle there’s a hint system which you can adjust the helpfulness of as and when you wish, or turn off altogether. You can expect, depending on your puzzle skills and whether or not you seek out every last line of dialogue, 3 – 5 hours of gameplay. 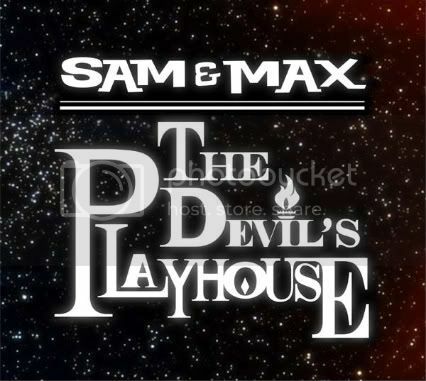 The Penal Zone is certainly worthy of the Sam & Max name and, if future episodes retain the quality of the gameplay while improving the consistency of the script, The Devil’s Playhouse will be an essential purchase.